I have been watching my colleagues use an iPad at the other end of a Skype conversation since April 5th and earlier in the week had a chance to actually use one for the first time. It doesnt take any time at all to get quite used to it! Now I am back in Italy and my own ‘Italian’ iPad was awaiting me — there is actually hardly anything at all Italian about it, except the Italian in the iTunes store. Apple’s minimalist design means that they really dont have to do much at all to ‘localize’ their products. According to La Repubblica one hundred thousand iPads were pre-ordered in Italy alone. Since the device has had overwhelming demand in Japan and the UK, it must be clear that Apple will very soon have sold their second million iPads. Not bad for a device that is still only 2 months old. The first apps downloaded to my system were of course the Exact Editions apps. 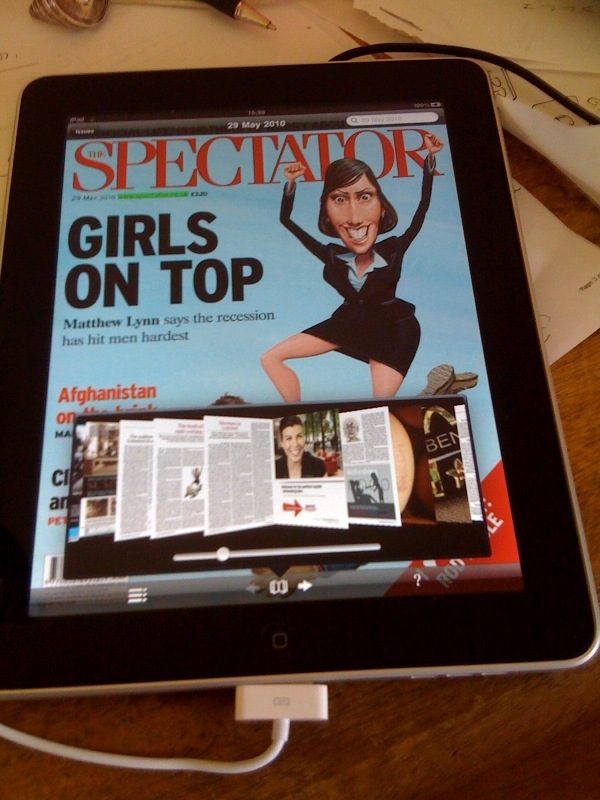 My first purchase was of the Pages application from Apple, closely followed by the Wired app. I will look forward to browsing and reading the Wired app this weekend. I was interested to see that the Wired app is only available for the iPad. We have taken the view that users will often want to read stuff on their iPhone and since this can be done pretty effectively with the Exact Editions system we obviously offer users both (they subscribe to a single app, a universal app, which can be used on either type of device). On the other hand it has to be said that magazines really do look MUCH better on the iPad, perhaps there is a perverse logic in requiring that the magazine app should only be readable on the less common, the more expensive, device. I am not sure what we would say if a publisher (say an Art publisher) specified that they ONLY wanted their book or magazine to be sold for an iPad audience. I guess we would go along with it…. It is certainly interesting to note that our universal apps have been mainly downloaded by iPad users. The figures are close, but since April 1 our apps have been going to the iPad:iPhone audience in roughly 51:49 ratio. Given the overwhelming superiority of the iPhone in terms of numbers of users that is a fact I find somewhat amazing.